“Thank Vets with Votes” was not created with the intention of telling anyone how to vote, just to seriously consider how their votes can affect veterans. I shared an article about budget cuts to veterans healthcare on the Thank Vets with Votes Facebook page. Reactions to the article indicated that it resonated with those who follow the page’s newsfeed, which came as no surprise. What was unexpected were the majority of comments (as of this writing) which suggested cuts to “welfare” and other safety net programs as a means to fix the funding problem at the VA. The question of what to cut and where when it comes to federal spending is always going to be a complicated one. It can be difficult to see how a slight change in a complex system can result in unforeseen and unwanted outcomes. Remember how Ian Malcolm used “the butterfly effect” to describe chaos and “predictability in complex systems” in “Jurassic Park”? Safety net programs like welfare, Medicaid and “food stamps” are popular targets for budget hawks in Washington but eliminating such programs won’t solve the underlying problems of poverty or effectively make up shortfalls in other departments like the VA. In fact, cutting the Supplemental Nutrition Assistance Program (SNAP aka “food stamps”) would actually hurt many active-duty military families that qualify for and make use of the program. To emphasize this point, many active-duty military families rely on food stamps so they can eat. It should also be understood that the majority of food stamp recipients are people with jobs but still don’t make enough money to pay their bills and feed their families. Eliminating food stamps won’t help them either. I’m not sure when the word “welfare” became a pejorative. The preamble to the U.S. Constitution states that one of the purposes of the new government being formed was “to promote the general welfare.” This has come to be referred to as “The general welfare clause”—though such clauses exist in many constitutions, charters and statutes and all have been subject to different interpretations as far as what sort of powers are indicated by them. General welfare is just that, general. It refers to the welfare of everyone. In modern vernacular, welfare is associated primarily with social safety net programs that have been implemented in an effort to keep people from falling into extreme poverty. It’s unfortunate that programs conceived to help the less fortunate have come to be used as a reason to stigmatize those very people. American culture in particular has a nasty habit of judging people based on little more than what tax bracket they fall into. While it may not be overtly stated that being wealthy makes one a good person—though I imagine I can’t be the only person who looks at the wealth accumulated by some people and wonder how much of it was obtained by less than ethical means—few people hesitate to condescend to those who don’t have much in the way of disposable income. The “affordability” of certain brands or shopping destinations are often looked down upon by some who honestly feel it would be “beneath them” to be seen at a particular store or wearing certain clothing labels. And if anyone should find themselves in need of assistance in order to pay their bills or to feed their families, they often try to hide that fact from others out of fear of being judged, not just as someone who’s “poor” but as someone who is “leaching off the system” or “abusing the generosity of others” regardless of the fact that most safety net programs are paid for with taxes, the appropriation of which most individuals have no control over. The older sibling quickly turned and snapped at the younger one, “Be quiet!” I could tell that they were embarrassed by this fact and angry at their sibling for revealing it to someone outside of the family. In recent years, the people who have come to rely on safety net programs do so because for many Americans, working full-time—and longer—just doesn’t pay enough to get by without help and it isn’t even limited to “low-skill” occupations. Many employers refuse to allow employees to work full time just so they don’t have to provide healthcare benefits. This leaves many people no choice but to work more than one part-time job to try and make ends meet, so someone could wind up working 50–60 hours a week but because those hours are divided between two—or more—employers, those extra 10–20 hours don’t qualify for over-time wages. Some of the largest, most profitable companies in the world actually encourage their hourly-wage employees to apply for food stamps and other public programs. Without petitioning Congress to change a single word of legislation, this effectively changes the nature of the safety net from that of temporary public assistance to permanent corporate welfare. For a company like Walmart, which accepts “food stamps,” they rely on SNAP to not only subsidize the wages of their employees, but to supplement their bottomline—since many Walmart employees do their grocery shopping at the same stores where they work. It’s unfortunate that so many continue to embrace the clichés of “welfare queens” and destitute people simply being victims of their own laziness or bad decisions. Choosing to believe those stereotypes and assumptions is what keeps many people from realizing that it’s not poor people “looking for handouts” that are abusing the system, it’s multi-billion-dollar corporations. Corporate officers have a fiduciary obligation to do everything that the law will allow to benefit their shareholders and that’s all the justification they need to pay poverty-level wages. Why pay a living wage when they can send their employees to the government to make up the difference? No matter how prosperous a society is, there are always going to be people who, through no fault of their own, find themselves unable to work or are extremely limited in their ability to do so. These conditions can be temporary or permanent requiring full-time professional care or just a means to afford shelter, food and healthcare. When times are difficult for many people over an extended period and the number of people applying for safety net programs starts to rise—often leading to histrionic speculation that the viability of the those programs is being threatened—actions needs to be taken to bring those numbers down. But the best way to “get people off of food stamps and Medicaid” is not to eliminate those programs. Doing so would only result in making poor, sick and hungry people poorer, sicker and hungrier. The most effective way to reduce the number of people applying for safety net programs is to implement socio-economic policies that improve the livelihoods of the majority of people, enabling them to be able to cover the costs of living—food, shelter, healthcare, etc.—so that they no longer need to seek out supplemental assistance. The first step toward doing this is recognizing that anyone who works full time—30–40 hours a week, regardless of what they do for work—should be paid enough to be able to live their lives without having to worry about being able to pay for their basic needs and those of their immediate families. When researching candidates running for public office, we need to press them for details about what they want to accomplish and how they intend to accomplish it. We need to recognize when ambitious personalities are attempting to placate us with repackaged, political platitudes. Are they out to “solve” superficial symptoms of pressing issues for short-term political gain or are they committed to addressing the underlying causes of society’s problems? And we mustn’t forget to consider how those policies will affect veterans. “If Americans want to thank veterans for their service, they shouldn’t just say it. They should show it. They should do something, like exercising the rights all veterans served to protect, and not try to take those same rights away from others over a difference of opinion. 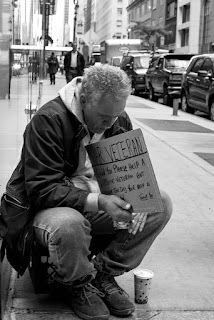 If Americans want to sincerely honor veterans, they should support legislation that actively helps veterans in need of housing, healthcare and employment. 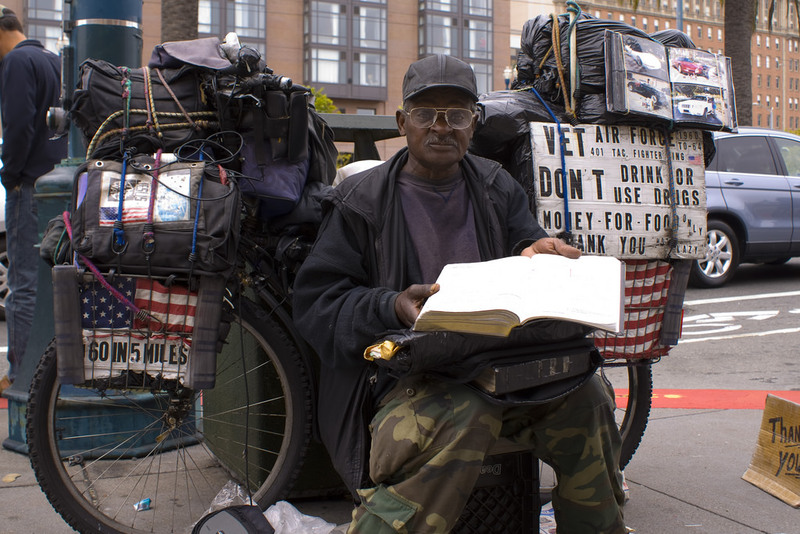 Among the adult homeless population, 11% are veterans. Americans who want to truly thank their veterans should vote into office public servants that understand that when active military service ends, veterans still need and deserve the support of their country and its citizens.